Oh, what a lovely treat for Easter! I had to make something choclatey – just wish I had the courage to do it before I did – they are – as my niece would say – Ah Mazing. The chocolate honey truffles are a snap to make. You do need to set aside a bit of time for the ganache to set in the fridge, but the actual making of the ganache and the dipping in chocolate part is a breeze. And tempering the chocolate could not be easier in the thermomix. I actually made the ganache one day, and did the dipping the next day, and that was fine. I gave some little bags of them to older nieces and nephews for their Easter treats, and some to neighbours as well. I would have eaten every single one of them myself if I had been given the chance, so I thought the safest bet was to get them out of the house before I burst out of my clothes! My sister had some last night and described them as a really upmarket Caramello Koala – and on reflection – she’s spot on! Make sure you use great chocolate for this recipe. I used the Yarra Valley Chocolate Company chocolate – which is a Belgian style coverture chocolate, which produced a really good result. It wasn’t cheap, but it was worth it! The recipe made about 70 little truffles – each one as lovely as the next! The ganache is soooo easy to make. Chocolate, cream, vanilla bean seeds, and honey. I used the honey that I had in the cupboard – and when I make these again I’ll try a different kind. Not that there was anything wrong with the taste, but I know that honey connoisseurs will disagree! I put in in a plastic tray to cool on the bench for a few hours, and then transferred it to the fridge to make sure it was really well set. I had ideas of using a melon baller to make perfect little balls, but my idea didn’t work, and I didn’t want to risk ruining the ganache by continually dipping the melon baller in hot water. In the end I just used a teaspoon and wet hands and moulded little spoonfuls into balls. I made all the balls first and put them on silicone paper and stored them in the fridge – it was a warm day here – while I made the tempered chocolate. They did stick to the paper a little, but all in all I think it was easier to do it like that than making the balls and then dipping them one by one. It did take longer than the suggested two and a half minutes to melt – which I was a little worried about until I checked Dani’s page on Facebook and saw that some chocolate takes longer than others – and the trick is to make sure it’s completely melted before you mix it to cool it down. The chocolate gets thick again pretty quickly, so the method to my madness was to have the balls already done as I’ve described above, which worked pretty well. I tried putting the balls on a toothpick and dipping them, but they were too big, so I ended up using a little cake fork, and it worked beautifully. 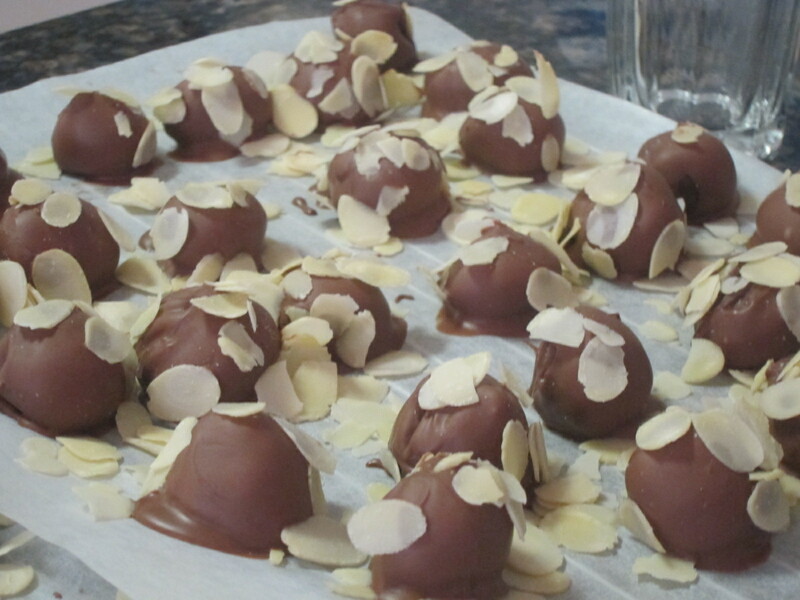 I put the dipped balls back on the silicon paper and then scattered flaked almonds over the top while the chocolate was still setting. When I do it again, I’ll have a little bowl of the almonds to dip them in again, and see how that goes. I did end up with a little (and it really was just a little) of the tempered chocolate left which is still in the fridge. Not sure if I can re-melt it or if it’s gone… but I wish I had have downloaded the In the Mix App and watched the video about it first…! Dani’s suggestion is to tip it over peanuts sprinkled with a little salt…it looks divine!! The “In the Mix” App is available through iTunes – and it’s free! It’s only for iPhones at this stage. Want the recipe? Check the recipe category on my home page!